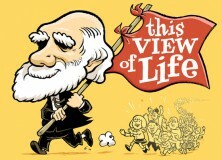 EVOLUTION:THIS VIEW OF LIFE is a new online general interest magazine in which all of the content is from an evolutionary perspective. It includes content aggregated from the internet and new content generated by a team of editors, all professional evolutionists, representing eleven subject areas. The editors work for free, in the same spirit as editors of academic journals. Their expertise enables EVOLUTION:THIS VIEW OF LIFE to feature evolutionary science in action, as stimulating for the professional as for the general public. To help launch the magazine, we are trying to raise $5000 through Kickstarter, which will be used to support the central office and purchase equipment for video and audio recording. Contribute $50 or more and get a cool t-shirt with this logo designed by illustrator Kevin Cannon. Pledge $80 or more and we’ll record a videocast with you, so that you can share what evolution means to your view of life.